I burst through the garage door into the warmth of the laundry room, simultaneously shrugging off my jacket, tugging off my shoes and dumping my bag in its spot. I stop for a brief moment to toss my coat onto the rack and correct the alignment of my shoes, perpendicular to the door – ok… that’s good. I step into the kitchen and slow down just enough to let the warm sudsy water rid the unseen dirt off my hands, before engulfing them into the plush yellow towel – hey, they deserve luxury too. I yank open the fridge and pull out a stick of butter* from its boxed container and rip off the paper its so carefully encased in. A quick zap, maybe 9 seconds? Yes, perfect – it’s at room temperature. I unduly toss the stick into the beloved stand mixer and turn it on low. I slide towards the pantry, pull out the large circular vessel holding at one point 10lbs of cane sugar. On my way back, I turn the dial on the oven to 350 degrees. I scoop out the cane sugar and quickly pour 1 cup of the granules into the mixing bowl whilst it’s still running, and then turn up the speed. Okay, crackety-crack, I slide in one egg at a time – two in all. The mixer still running, I make a grab for the plain yogurt and dollop two spoonfuls right into the gooey mixture. It instantly curdles, yay, that’s what I want to see – no explanation necessary, that’s just what it does. Good, I see the bananas lying in the fruit bowl and they are spotted with dark brown circles. I immediately grab two large and slightly limp yellow sticks, tear their skin off and plonk them whole into the still running mixer. As the whirring of the mixer continues, I grab the almond meal and stoneground whole-wheat flour from next to their neighbor, cane sugar. I bring the mixer to a halt; I toss in ½ cup of the nut flour and then 1 1/3 cups of the stoneground one. I fold them in slightly, so as not to encase my kitchen in a cloud of flour when I turn it on again. I hastily pull out the spice draw and select the almost empty jar of ground cinnamon and make a mental note to add it to my shopping list. I sprinkle in about ¼ teaspoonful’s worth of it. I also add ¾ teaspoon of baking soda and ½ teaspoon of baking powder into the bowl with a dash of sea salt too. A quick stir of the mixture with my faithful spatula ensures the safety of the ingredients; they will stay in the bowl. I again, turn on the dutiful mixer and let it circle around at medium speed for about a minute, whilst I start unloading the dishwasher. Approximately a minute later I gently lift the trunk of the kitchen aid -after turning it off of course – disengage the paddle and scrape off the creamy dough. Lastly but not least, I dump 2 heaping spoonful’s of chocolate malt powder and gingerly swirl it into the dough. 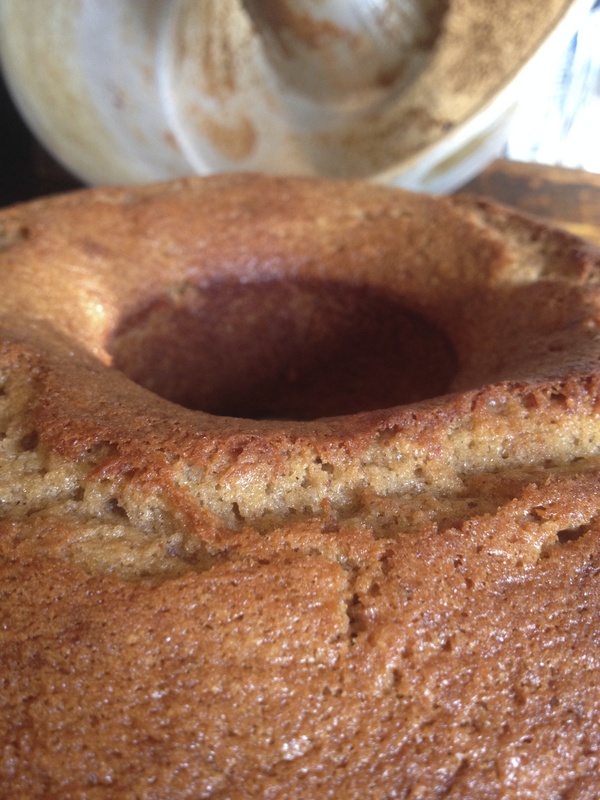 I carefully scrape the creamy banana scented batter into an 8-inch aluminum Bundt pan I just oiled. I immediately set it into the oven and close the door. Voila! I look at the ticking watch on the wall, I have 40 minutes to start the dinner, finish unloading the dishwasher and maybe run the vacuum for a bit. Loads of chores later, the nutty and ghee-ey aroma magically creeping into the rest of the house teases me, reminding me to peek in on the cake. I reach the oven just when the timer goes off, perfect timing! I peer in at the cake and the brown crust adorning the top of the cake assures me it’s ready to leave the warm cave it has grown in. I push in a toothpick anyway and it came out clean. Pure satisfaction! I click the oven off and slide the pan onto the cool granite counter so it may continue forming the wonderful crunchy crust my family adores, as it cools. As I make a dash for the door, I turn back realizing I have a couple of minutes to spare. I single out my grandmothers butter knife and carefully work my way around the perimeter of the cake, gently coaxing the spongy goodness away form the pan wall. I balance a plate upside down over the pan and swiftly turn it over and give it a little knock with my knuckles. 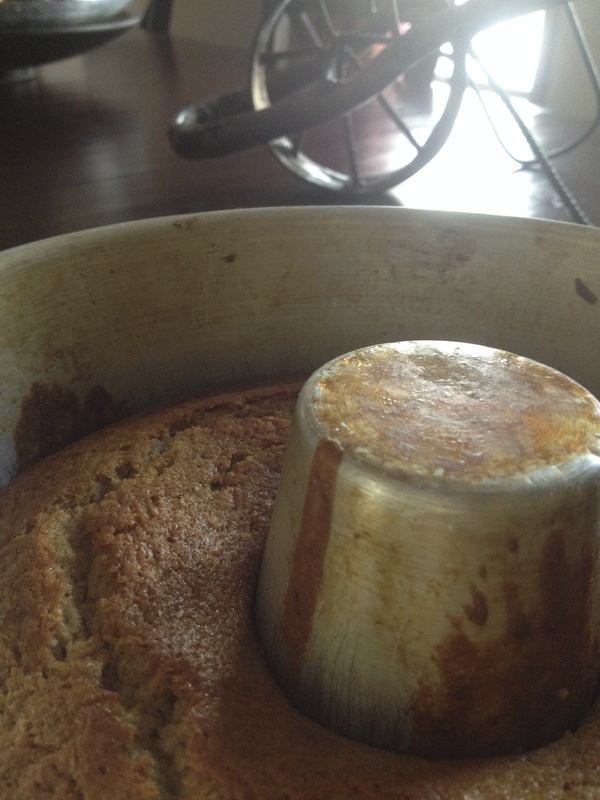 The graceful thud I hear assures me the cake has released the pan with a ladylike charm. 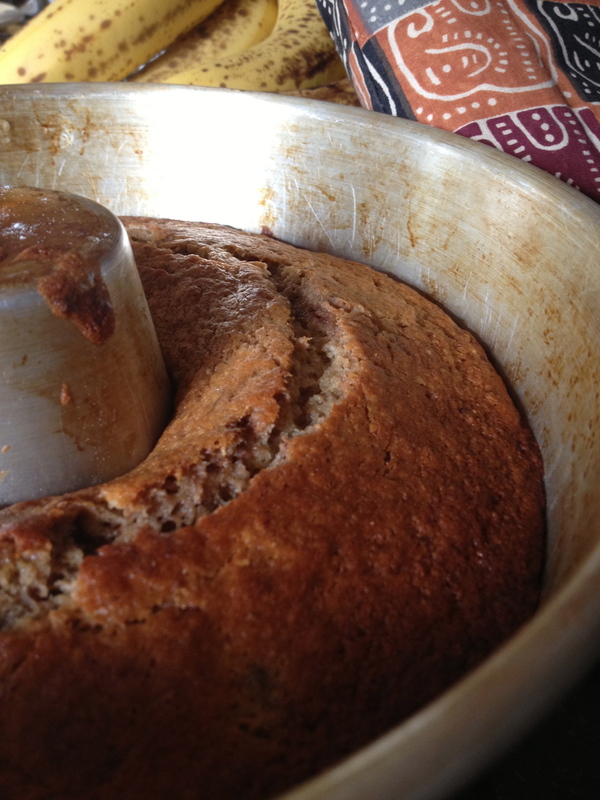 The Banana Cake now adorns the crystal plate its settle upon. I glance at the clock, I still have a few seconds to play with and I greedily cut a thick slice of cake. 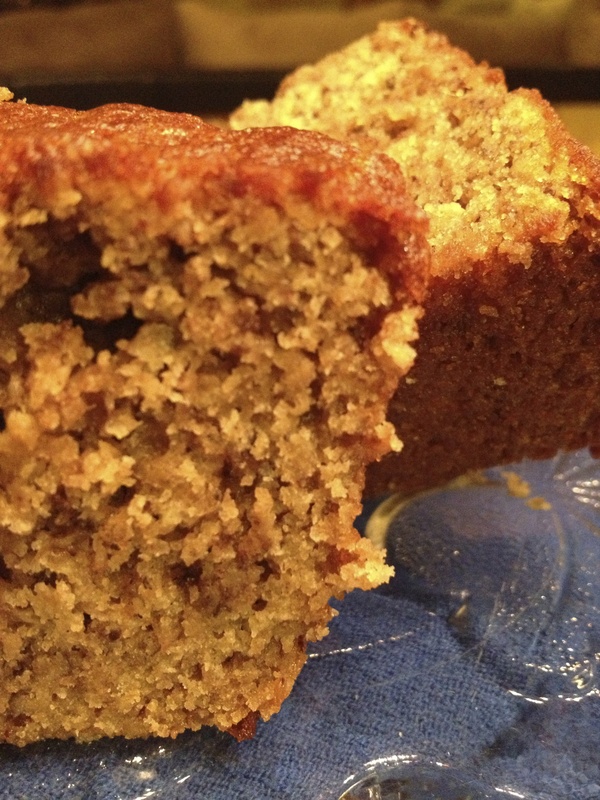 I tear off the corner and shove the warm and moist sweet morsel into my mouth. The perfectly browned crust crunches with ease giving way to the center of the warm and crumbly cake speckled with chocolate. Taking a deep breath of the banana scented air I know my kids are going to love; I head through the laundry room on my way to pick them up. With a smile on my face I once again don my coat, slip on my shoes, and slam the door shut behind me. Well, there you go, a little peak of the goings on in my kitchen! * 1/2 cup of ghee can replace the butter. Initially, as a teenager, I made this recipe from the Indian Delights cookbook by Zuleika Mayat. I would follow it ‘word for word’ and it was truly delicious! Over time I have adapted it to suit my changing palette. And the above recipe is the one I now use on a regular basis, almost once a week, I might add. ****Update: “Where’s the ghee in the recipe above? ?” said one of my readers. I wrote the descriptive part of the recipe a couple of months ago when I was using butter instead of ghee. I guess I am human, lol, and it simply flew right over my head that I hadn’t altered that part of the recipe. I can’t bare ripping out the paragraph describing the butter scene therefore mentioning the whereabouts of the ghee here. I will be posting the recipe in regular format soon too. I hope you enjoyed reading this post because let me tell you, it was so exciting writing it for you. 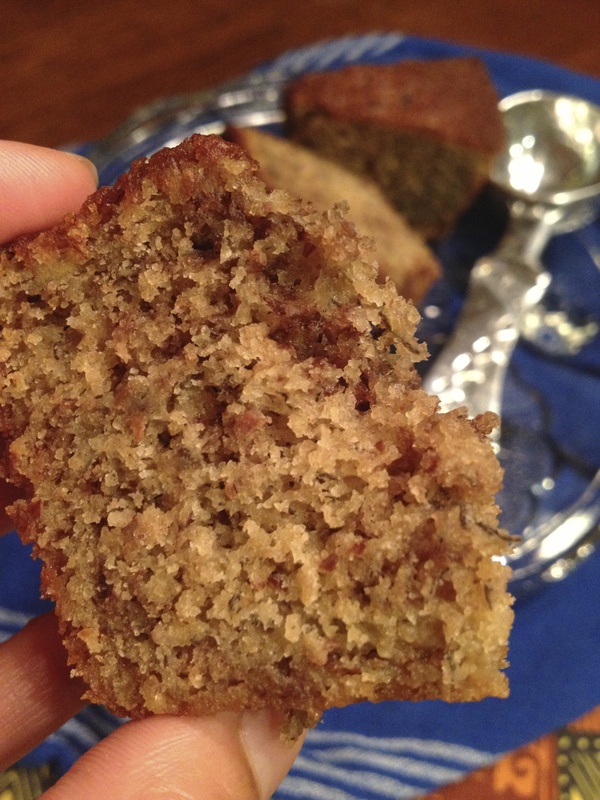 This entry was posted in Baked Goodies, Breakfast, Dessert and tagged almond meal, baking with ghee, banana bread, banana bread recipe, cake, Chocolate, chocolate malt, ghee. Bookmark the permalink. Sounds good, but I couldn’t find at which point the ghee is included in the recipe? Anytime…. Any particular brand of stone ground brown flour you recommend? King Arthur? Or from a co-op? Any brand of stoneground flour is good. I usually buy what’s on sale at a coop or health food store. enjoyed reading it..thank u for sharing it. Hey no problem Meriem! I love sharing my recipes with you all. Yum! I love the addition of the chocolate malt – sounds fantastic. Omg! 😋yum! I want some now. 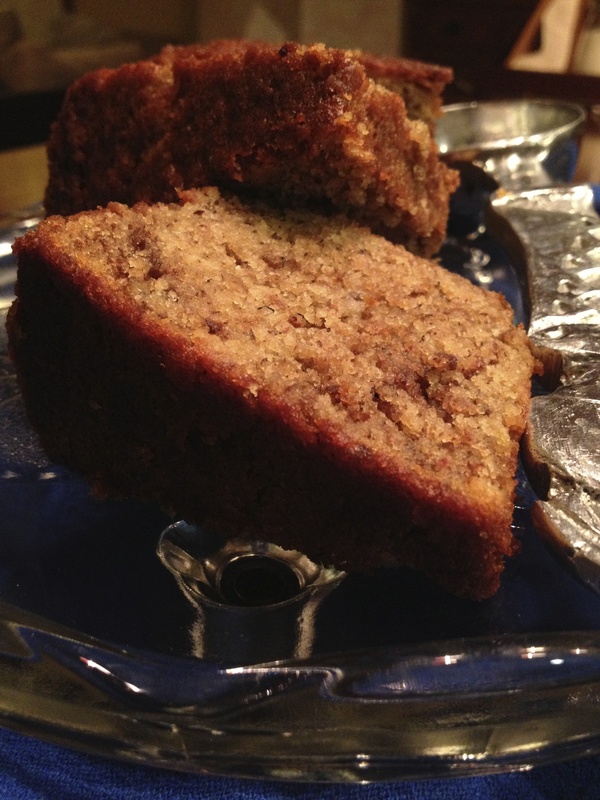 Wishing I had some warm banana bread right now. I look forward to you posting the recipe! I sure will 🙂 Tracy that’s awesome that u could stop by. Shamim, this is absolutely beautifully written! I loved it! And the recipe sounds wonderful.